Lexus will take its advanced hybrid power technology to a higher level in 2009 with the launch of the new RX 450h. The luxury all-wheel drive model made its world debut recently at the Los Angeles Auto Show, ahead of going on sale in Europe next summer. Lexus was the first, and remains the only manufacturer, to offer hybrid models in this segment in Europe. Lexus is not slow to point out that it is now presenting its second generation model before its rivals manage to bring their first hybrid contenders to the showroom. We will have more details about the new Lexus RX 450h early in the new year. Lexus says the current RX 400h already addresses the prime concerns of today’s motorists, applying advanced technology to deliver high performance and whisper quiet refinement, combined with excellent fuel and emissions efficiency. The RX 400h gives great fuel consumption (34.9mpg combined cycle ) and carbon dioxide emissions (192g/km ) that earn a low tax rating. 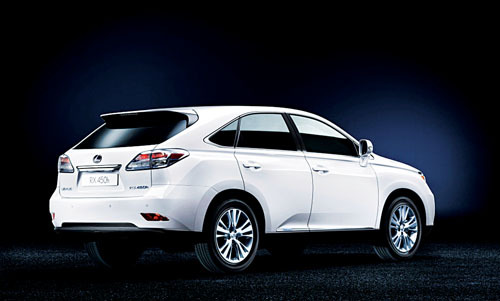 Lexus says it all adds up to make the RX 400h as cost efficient to own and run as a smaller family car.